The story of Joseph’s life in Genesis is a compilation of three separate events in his lifetime. Two of these events are year specific; when Joseph was seventeen (Gen. 37:2) and when Joseph was thirty years old (Gen. 41:46). The third event is not individually determined chronologically. The only way to discover the third event is to work the mathematics of his life in comparison to his father’s life events. For instance, Jacob worked for Laban at Padan-aram for twenty years (Gen. 31:41) to acquire two wives and cattle. Adding these twenty years to his length of life (forty years, by inference of his twin’s age; Gen. 26:34) when he escaped from Esau, totals sixty years old when Jacob returned to Canaan. Logically it is to be assumed that Joseph was born when God “remembered” the fourteen years were exhausted of Jacob’s agreement with Laban for Rachel to wife (Gen. 29:20; 30:22). So, forty years old plus fourteen years of labor for two wives equals fifty-four years old at Joseph’s birth. Subtract the fifty-four years difference between their ages from Jacob’s age at death (147 years, Gen. 47:28) and the seventeen years of Jacob’s sojourn in Egypt and the conclusion is Joseph was seventy-six years old when Jacob entered Egypt. Jacob was one hundred and thirty years old (Genesis 47:9) when he entered Egypt in the second year of famine (Gen. 45:6). Joseph then stood before the Pharaoh of Egypt to interpret his dreams when he was sixty-eight years old, not thirty years old as has always been assumed. Thus we have derived the chronological sequence of Joseph’s life in Genesis. Further, when Joseph was thirty years old he then stood before a previous Pharaoh who apparently appointed him Priest of On (Heliopolis) and gave Joseph Asenath to marry (Gen. 41:45). Again, logically there must be enough years in his story to accomplish the statement of the progeny he was blessed with (Gen. 50:23). In conclusion mathematically then, Joseph’s brothers hadn’t seen him for fifty-nine years when they went to buy grain in Egypt which makes sense of their non-recognition of their brother. Also, Joseph was in his prime at sixty-eight years old since he lived to be one hundred and ten years old. There isn’t any need to enter an argument or statement of support as this stipulation has been fully documented in Dr. Lennart Moller’s THE EXODUS CASE. If you are a believer, it is necessary for you to buy and read this book completely. One observation though is the first Pharaoh Joseph encountered named him Zaphnath-paaneah (Gen. 41:45). If the Bible had recorded the name given him by the second Pharaoh (Imhotep) there wouldn’t be any mystery. I’m mystified at the reason God has to make a game out of historical documentation! Maybe it’s boring in Heaven and he just has to play with us “grasshoppers”. “It is the glory of God to conceal a thing: but the honour of kings is to search out a matter.” (Proverbs 25:2). There hasn’t been a political character that illustrious in thousands of years. “I wisdom dwell with prudence, and find out knowledge of witty inventions.” (Proverbs 8:12). Egyptologists speculate Imhotep wrote much literature and if Imhotep was indeed Joseph then possibly Imhotep’s literature was incorporated into Proverbs of Biblical fame. “Wisdom” is then a metaphor which partially refers to Imhotep’s legacy of historical intelligence; Joseph’s claim – “Behold, I have dreamed a dream more; and, behold, the sun and the moon and the eleven stars made obeisance to me” (Gen. 37:9). 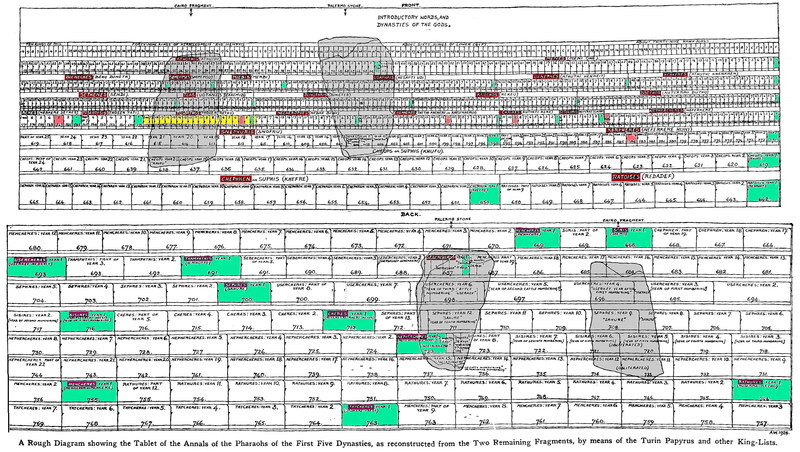 There are two numerical multiples in the Bible that delineate historical chronology; 1). 33-year life of Christ. 2). 49-year Sabbatic Cycle. The convergence of the multiples determine the year of Flood (3200 B.C.) and Year of Exodus (1584 B.C.). 33 x 49 = 1617 years. The antediluvian dates are derived from these calculations, as are the Saint’s years from Noah till Jacob’s death. The final correction in the Julian calendar was accomplished in the year A.D 33 which set the terminus year for these calculations, including a zero year. In Genesis several statements form the background calculations to place Joseph in certain Pharaoh’s houses. The first is the Pharaoh known today as Zoser, but in Arthur Weigall’s book named Pharaoh Tosorthos; same person though. He instructed Imhotep to build the Step Pyramid in Saqqara. We know Jacob died in the year 1926 B.C. and spent seventeen years in Egypt. So, Jacob entered Egypt in 1943 B.C., the second year of famine. But that isn’t the final anchor to align the Biblical and Egyptian chronologies. The answer is what year Joseph stood before Pharaoh Zoser! The clues in Genesis are “two full years” (Gen. 41:1) and “a season in ward” (Gen. 40:4). There were three seasons in Egypt, each four months long; in the third year then, because the previous reign (Necherophes) was exactly 19 years (Weigall p. 11). An assumption must be made here that these statements are referring to the period from the inception of Zoser’s kingship. If so, in Zoser’s third year Joseph (sixty-eight years old) stood before Pharaoh, King of Egypt (1951 B.C. ), and so the complete chronology of the first five dynasties are determined. Joseph was born in “todays” Turkey in 2018 B.C. possibly in the interim between the fifteenth Pharaoh from Menes (Sesochris) and his successor Pharaoh Chaires. When Joseph was seventeen years old (2001 B.C.) he was sold into Egypt to Potiphar (“an officer of Pharaoh”; Gen. 39:1). It’s recorded Joseph was put into prison (in the reign of Pharaoh Chaires), but no record of what year, although the length of his stay is mentioned (“a season in ward”). He must have had an exemplary record and become an employee of the prison, because at thirty years of age (1988 B.C.) Pharoah Chenneres gave Joseph, Poti-pherah’s (same person?) daughter to marry (payback maybe?). It says the “keeper of the prison” “charged” Joseph as if it were a job. It mentions Joseph “was” (earlier) bound there, in “ward”. So, many years later Joseph encounters the baker and butler at his job in the prison and the story unfolds about interpreting dreams. Gen. 41:14 mentions Joseph being “brought hastily out of the dungeon” (shaved, clothed), but not his position in the prison. The assumption is Joseph worked at the prison for thirty-eight years? This theory of Joseph’s life is supported by the statement “And unto Joseph were born two sons before the years of famine” (as much as 38 years before famine; Gen. 41:50), very cunning Hebrew textual manipulation as Joseph wouldn’t have been married and produced children as a ward (“bound” Gen. 40:3) in Pharaoh’s prison. The obvious contradiction to this story is Joseph asked the butler to mention to Pharaoh to “bring me out of this house” (Gen. 40:14), especially if he was the High Priest of Heliopolis and was Potiphar’s son-in-law; it is probable the Pharaoh worshiped Osiris and not Re of Heliopolis, but it isn’t certain “house” refers to the prison. The thought has occurred to me that a very jealous person wrote this account of Joseph’s life. Obviously, the statement about being “shaved and clothed” is out of context and occurred when the original Pharaoh appointed Joseph, Priest of On. The story all builds up to read possibly like the famous life of Imhotep. Jacob dies at one hundred forty seven years (1926 B.C.) in the reign of Pharaoh Aches and Joseph dies at one hundred and ten years (1909 B.C.) in the reign of Pharaoh Kerpheres, the years being marked in red on Weigall’s chart. The first year of each Pharaoh’s reign is marked in green. The era of the fourteen years of feast and famine are marked in yellow. I had nothing to do with the creation of Arthur Weigall’s book or charts. I scanned the chart digitally and colored it. Any information about the chart itself will only come from reading Weigall’s book A HISTORY OF THE PHARAOHS; THE FIRST ELEVEN DYNASTIES. There are some discrepancies in the story of ancient Egypt. Most scientific men 100 to 200 years ago were Biblically trained, which influenced their perception of the historical picture of Pharaonic Egypt. Specifically construed was the identity of Menes in relationship to the Hamm of the Biblical story. It is illogical that Hamm was identical to Menes and could have unified a country that didn’t yet exist. Hamm’s immediate family were the only inhabitants of “Misr” at that particular moment in history, according to Genesis in the Bible (Psalms 78:51) and many other references. The date of the foundation of Egypt, while very important, is much confused by the chronology associating Menes with this epic date. Menes was associated chronologically with the beginning of Egypt but actually lived many hundreds of years later than Hamm. In spite of all attempts to correlate Biblical literature with archeological chronology this basic fact of misalignment is certain. Egyptologists assume as a default that Menes’s reign and Egypt’s epic are concurrent events. Only by exhaustive study will this assumption be apparent. It is a “gray” area of history between secular scientists and Biblical historians. For instance, all Egyptologist’s conclude that hieroglyphics were in immediate use at Egypt’s epic when logically there must have been a long developmental period. Scientists are much confused by this as they attempt to push pre-historic Egypt into the Biblical Antediluvian Period, but it is quite apparent the first row of Weigall’s chart is dated from c. 3200 B.C. through 2494 B.C., the Egyptian 700-year Pre-Dynastic Period. Abram then entered Egypt sometime during Pharaoh Kaiechos reign. 1 Menes 62 years + 2493 B.C. – 2432 B.C. 2 Athothis 57 years + 2431 B.C. – 2375 B.C. 3 Kenkenes 29 years + 2374 B.C. – 2346 B.C. 4 Uenephes 26 Years + 2345 B.C. – 2320 B.C. 5 Usaphais 41 years + 2319 B.C. – 2279 B.C. 6 Miebis 13 years 2278 B.C. – 2266 B.C. 7 Semempses 9 years 2265 B.C. – 2257 B.C. 8 Bieneches 28 years + 2256 B.C. – 2229 B.C. 9 Boethos 47 years + 2228 B.C. – 2182 B.C. 10 Kaiechos 39 years + 2181 B.C. – 2143 B.C. 11 Binothris 38 years + 2142 B.C. – 2105 B.C. 12 Tlas 17 years + 2104 B.C. – 2088 B.C. 13 Sethenes 37 years + 2087 B.C. – 2051 B.C. 14 Nephercheres 32 years + 2050 B.C. – 2019 B.C. 15 Sesochris 8 years + 2018 B.C. – 2011 B.C. 16 Chaires 11 years + 2010 B.C. – 2000 B.C. 17 Chenneres 27 years + 1999 B.C. – 1973 B.C. 18 Necherophes 19 years 1972 B.C – 1954 B.C. 19 Tosorthos 19 years + 1953 B.C. – 1935 B.C. 20 Tosertasis 6 years + 1934 B.C. – 1929 B.C. 21 Aches 6 years + 1928 B.C. – 1923 B.C. 22 Kerpheres 24 years + 1922 B.C. – 1899 B.C. 23 Snephuris 24 years + 1898 B.C. – 1875 B.C. 24 Cheops 23 years + 1874 B.C. – 1852 B.C. 25 Ratoises 8 years + 1851 B.C. – 1844 B.C. 26 Chephren 18 years + 1843 B.C. – 1826 B.C. 27 Soris 1 year + 1825 B.C. – 1825 B.C. 28 Mencheres 18 years + 1824 B.C. – 1807 B.C. 29 Sebercheres 4 years + 1806 B.C. – 1803 B.C. 30 Thampthis 2 years + 1802 B.C. – 1801 B.C. 31 Usercheres 7 years + 1800 B.C. – 1794 B.C. 32 Sephres 12 years + 1793 B.C. – 1782 B.C. 33 Cheres 4 years + 1781 B.C. – 1778 B.C. 34 Sisires 7 years + 1777 B.C. – 1771 B.C. 35 Nephercheres 21 years + 1770 B.C. – 1750 B.C. 36 Rathures 11 years + 1749 B.C. – 1739 B.C. 37 Mencheres 8 years + 1738 B.C. – 1731 B.C. 38 Tatcheres 7 years 1730 B.C. – 1724 B.C.